A spokesperson from Cambridge Cycling Campaign was interviewed on BBC Radio Cambs today on the issue of the lorry delivery proposals. They welcomed the decision. We welcome their support, though we recognise of course that they have no view on the kinds of issues relating to independent traders that we have. TWO appeals by supermarket giant Tesco for permission to build an extension as part of plans to open a store in Cambridge’s Mill Road have been dismissed. The company had wanted to build a single-storey extension at the back of the former Wilco store and install plant equipment. The application was made along with proposals for a shop front, ATM and two signs. But while Cambridge City Council approved two of Tesco’s planning applications, it rejected the proposed extension and installation of refrigeration equipment. Tesco appealed against the refusal of planning permission. It also lodged an appeal on the grounds of non-determination. A four-day hearing was held at the beginning of October and now planning inspector David Nicholson has dismissed both appeals. He concluded the servicing options for the store would “pose unacceptable risks to highway safety”. 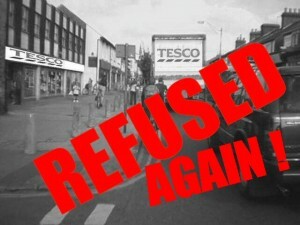 Sonia Cooter, co-ordinator of the No Mill Road Tesco campaign, said: “We are very happy. “The planning inspector quite comprehensively ruled out any safe delivery options. It’s up to Tesco now to decide whether they want to go any further. Martin Lucas-Smith, co-ordinator of Cambridge Cycling Campaign, who gave evidence at the public inquiry, said: “Cambridge Cycling Campaign is delighted to hear that Tesco’s ridiculous proposals for deliveries directly from Mill Road or by sending large lorries down the narrow streets of Romsey have been comprehensively and unequivocally thrown out by the Government inspector. “We objected to the plans and the Government inspector has accepted the evidence we put forward at the public inquiry that cyclists and indeed everyone else using Mill Road would be badly affected by Tesco’s delivery proposals. A statement released by Tesco read: “We are obviously extremely disappointed by this decision. We will be considering the report and looking at our options. Breaking news: Tesco have LOST their first appeal (and the associated non-determination appeal) for the Mill Road site. Read the full Appeal decision letter from the Government Inspector. It remains to be seen if Tesco will pursue their second appeal (for an application to instal plant with no extension). For now, though, we would like to thank everyone who has made this possible. Thank you if you came on the march, wrote letters of objection, emailed your councillors, formed part of our human lorry, trudged around delivering leaflets and posters or just spoke to people about Tesco’s plans. This campaign has been a huge community effort and everyone’s contribution has been vital. Have a look at the new counter on the right-hand side of this page to see how many days we as a community have so far managed to keep Tesco off Mill Road!